As we come to the end of another year in the garden, I thought I’d share with you a few of my favorite tools that have made my life just a little bit easier this year. You’d think that since I’m a garden designer, garden writer and an overall fanatical gardener that I’d have every latest and greatest garden tool in my arsenal. But I don’t. In this department, I’m pretty low maintenance, preferring to use just a few of my favorite standbys. In fact, it drives my husband crazy as it would make it so much easier for him to buy birthday gifts for me if I did have a running wish list of tools. Every once in awhile, though, I come across a tool that makes me slap my forehead in a what’s taken me so long to discover this moment. Here are 3 of those tools that have made it to my carefully edited ‘trusted standby’ list. And with the holidays right around the corner, it’s a perfect time to add them to your own collection. Enjoy! I have a gorgeous ‘Sally Holmes’ climbing rose that scrambles high along the fence that I share with my neighbor. Whenever I need to prune the tallest canes, I have to climb to the top of a ladder (always a scary ordeal) in an attempt to prevent the cut branch from falling into her yard instead of mine. The Cut & Hold pruner, by Wildflower Seed & Tool Company, has solved my problem once and for all! I simply extend it, place the head in the ‘grasp’ position, cut the branch and easily lift it down wherever I like. No more ladders and no more branches falling over the fence and annoying my neighbors. 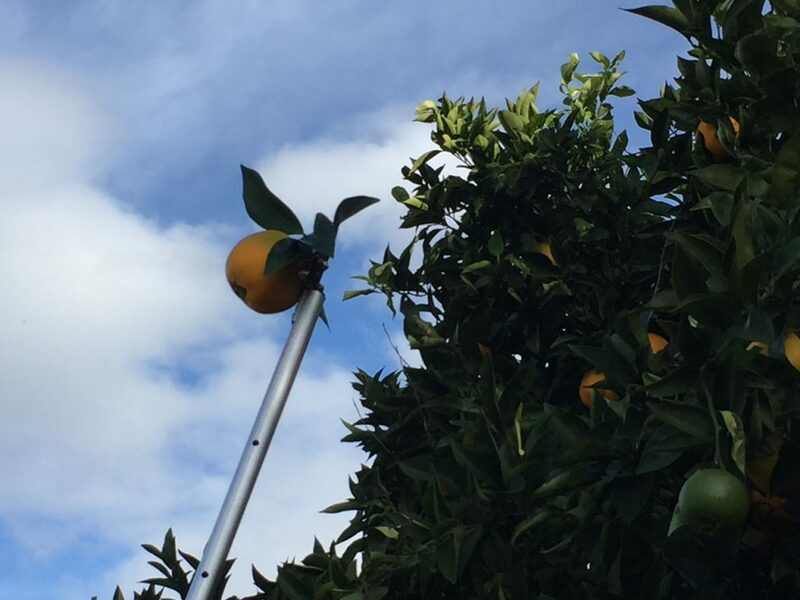 I also just discovered that I can also use this tool to help cut my oranges that grow at the top of my large Washington Naval tree, bringing them safely back to down without crashing to the ground. How have I gardened my entire life without this knife? That’s where the hori-hori knife comes to the rescue. This tool cuts through the cement-like root ball like a hot knife through butter. And it’s not only fun to use but is reasonably priced, durable and built to last for years. Plus, I’ll admit, carrying this around in my tool kit sort of makes me feel like a tough chick. For years, I’ve read glowing reviews about this tool, written by fellow garden writers. After finally using it in my garden this past year, I can honestly say I love it as much as everyone else. Not only because the tool is amazing (more in a moment) but because the company is, as well. CobraHead, a family-run business, makes all of their tools in Wisconsin, uses environmentally friendly materials whenever possible, and supports urban and community gardens internationally by donating tools for use and fundraising projects. But beyond being an amazing socially conscious company, this tool has quickly become a favorite of mine, going everywhere with me in the garden. Billing itself as a ‘steel fingernail‘, it uproots difficult weeds in a split-second (say goodbye to those dandelions that have wedged themselves into tight cracks) and breaks up hard clay blobs that form a crusted surface, allowing me to easily dig a trench and bury irrigation tubing. But one of my favorite ways to use this tool is like an extension of my hand. When working in tight spaces in the garden, it extends my reach, allowing me to pull out mounds of debris/weeds/leaves that lurk behind larger plants with a simple scraping motion. I hope you all get the chance to work with one (or all!) 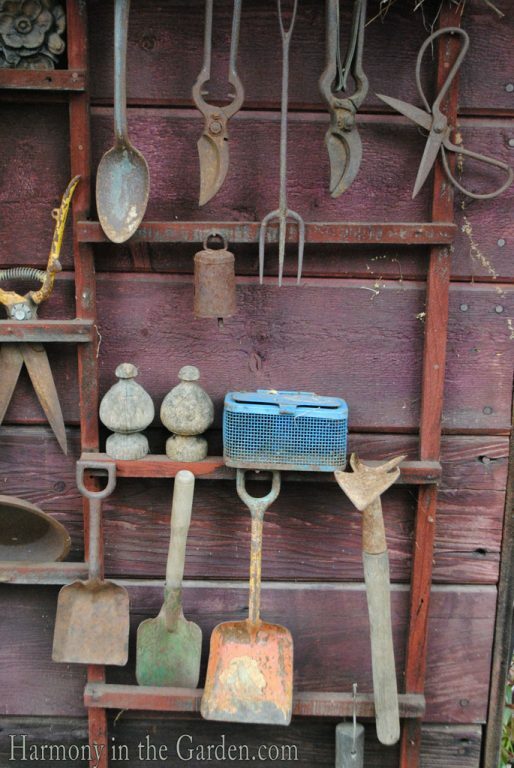 of these tools, and would love to hear about your own favorite garden tools that you couldn’t live without. The hori hori knife is my go to tool when working in small or medium containers. It is more precise and sturdy than a trowel. It was given to me as a gift about 10 years ago and except for a couple of superficial scratches shows no signs of wear. These do sound useful and particularly the CobraHead weeder for me! Thanks Rebecca. I love the cut and hold pruner. I need to give this version of it a try. Yea for not climbing tall ladders and not causing brain damage from falling grapefruits and oranges. Thank you, thank you for the heads up––literally! Love you sweet Rebecca. You’re welcome, Sharon – you’ll love the Cut & Hold…every time I use it, I’m so glad I have one! Would the CobraHead Weeder be good for uprooting the pesky iris plants that are coming up everywhere in my garden? Hi Meri-Beth…the CobraHead works wonders on any tough weed or small plant. I say give it a try – I bet you’ll love it as much as I do! I’d feel like a tough chick with the telescopic pruners! And to keep stuff from falling into my neighbor’s yard. Not to mention having to spend the afternoon at the emergency center after falling off the ladder. . .
I’m with you, Linda, I don’t need any more reasons to visit the ER this year. All hail the telescopic pruner!! Happy Holidays, to you too, Joanna. I think Roman, er…Santa…needs to get one of these for you this year. You’ve been a good girl and deserve it! I just got a hori knife. It is awesome. I just gave Hal my request for the Cobra Head weeder for Christmas. Exactly what I need to reach those stubborn weeds. Thanks for the great info. Love and Hugs. Jean G.
Hi Jean – glad to know you love your hori hori knife as much as I do! I bet you’ll be thrilled with your CobraHead weeder, too – I have dandelions that grow between the street and my driveway and this has been the only tool that effectively remove them, along with their mile long tap root!